Huawei has officially unveiled the Mate 10, or several Mate 10’s for that matter. The Chinese smartphone maker has launched 3 different models namely the Mate 10, Mate 10 Pro and Mate 10 Porsche Design. The latter is a high end luxury model while the first two are geared towards the mainstream consumers. Starting off with the design, Huawei was keen to point out that the Mate 10 and Mate 10 Pro have an 18:9 aspect ratio “FullView” display. In layman terms, the two phones have “bezel-less” displays following the 2017 trends. There are no rounded corners or notches on the Mate 10 siblings. The company used a mixture of 3D glass and metal for the phone. It has a curved back, designed for making it easier to hold despite its large size. 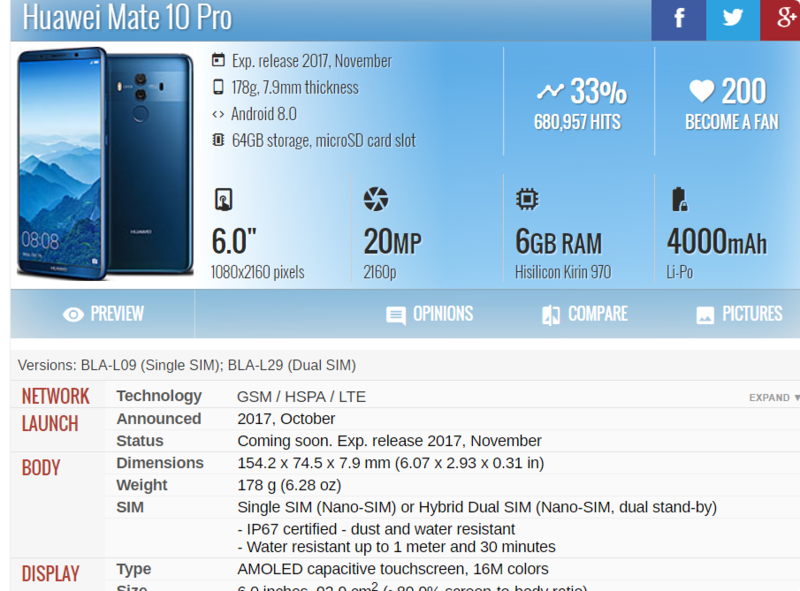 Huawei Mate 10 has a 5.99 inch QHD (2560 x 1440) IPS LCD display while the Mate 10 Pro features a 6.0 inch Full HD+ (2160 x 1080) resolution OLED screen. It’s brightness can go from as low as 1.8 nits up to 730 nits. Additionally the two phones also support HDR 10. Thankfully the company also added water and dust resistance to the Mate phones this time around. The Mate 10 has a meager IP 53 rating while the Pro has an IP 67 rating (same as the iPhone 8). Another key difference between the two phones is the fingerprint sensor, Mate 10’s sensor is on the front while the Pro’s sensor is on the back. The fingerprint sensors unlock the phones in 0.33s according to Huawei. Unfortunately, in true 2017 fashion, Huawei has removed the headphone jack from the Mate 10 and Mate 10 Pro. As rumored, Huawei has included an octa-core HiSilicon Kirin 970 chip in the Mate phones. The only notable improvement is power efficiency for the processor. What makes the Kirin 970 different from the 960 is the Neural Processing Unit (NPU). Kirin 970 and the EMUI 8.0 in conjunction form the base of the NPU. It will use machine learning to learn user behavior then predict what your actions are and allocate resources accordingly. RAM and storage options for the Mate 10 range from 4/64 GB, 6/128 GB and 6/256 GB. The Mate 10 Pro, on the other hand, features 6/64 GB, 6/128 GB and 6/256 GB RAM and storage combos. Mate 10 and Mate 10 Pro will come with Android 8.0 Oreo out of the box with Huawei’s EMUI 8.0 skin. Like the Samsung Dex, Huawei Mate 10 and Mate 10 pro have a PC mode as well. They also have split screen app functionality which was previously unavailable on the EMUI. Additionally Huawei has touted the two phones as the world’s first 4.5G smartphones. For the camera, Huawei used Summilux-H 1/1.6 Leica lenses. The Mate 10 duo has 12 MP RGB + 20MP Monochrome sensors with an f/1.6 aperture. In addition they have a Dual LED flash, OIS and a hybrid PDAF+Laser autofocus. The cameras also have dual ISPs with better low light performance, according to Huawei. Mate 10 has a 30% better battery life compared with Mate 9. The phones have a 4,000 mAh unit and are the first safe fastcharge devices certified by TUV Rheinland. The phones are also getting wireless charging support on top of fast charging. The fast charging has also been improved, the Mate 10 siblings can charge up to 58% in 30 minutes. Huawei hasn’t announced the prices for the two phones however they did announce availability. You can expect these devices to hit the market by mid-November. Yahi omeed thi ap si. koi kheera to nikal lethy hai. Yar khud ko update karo. apko masla kya hai usb type c earphone leny mi? is it “dual active,dual standby”? It’s 2017. Even low end phones these days are dual active so thinking a flagship device isn’t going to be one is pretty absurd. Its 2017 and Mate 10/Pro phones are only Dual Standby and NOT dual active! Therefore Useless phone in my opinion! Dual active note 8 bhi nahi he… Konsa phone dual active he? They are dual active but I am not advocating these phones. All dual sim phones should be dual active. No new dual active phone in 2017. But that does not justify buying a phone that is new but is not dual active. It should be rather single sim then. Your other number is automatically OFF when you are on a call one one sim. You cannot benfit from call waiting or merge calls between two networks from two different sims or at the very least get notified that there is an incoming call that you might want to hold while you pick another. So it is impractical use of the other sim slot. Also the other slot takes over the sim card slot for absolutely no reason because of that. So many problems why the other sim slot is useless for the above mentioned phone and that is crux of my original comment! Dual active phones with dual radios are the need of thee hour among other things and other features. Huh the Pro has a lower PPI screen than the regular version. Who’s idea was this lol. Huawei MATE 10 — Porsche Design is also launched in some countries… I guess its about or more 180,000 Rs in Price if someone buys it… for that designer phone……. Phew. !